Joe Shuster’s cover, Superman #1. This year marks the 70th anniversary of Superman. As an offshoot of the celebrations I was interviewed at length about the meaning of the superhero genre by the CBC’s Jian Ghomeshi for the radio program Q. You can listen to an Mp3 file of the interview here. Krazy Kat — please click on art for a better view of this Sunday page. The facts about George Herriman have been known for a long time: he was born in Lousiana in 1880. The birth certificate listed him as colored. Other documents described every other member of his family as colored. They were in fact of mixed racial ancestry: “mulattos” in the terminology of the time, having some African ancestry but with skin color only a shade darker than most northern Europeans. Herriman’s family moved to Los Angeles around 1886, most likely to escape the increasingly rigid racial regime of the American South where they would have been segregated. In California, they reinvented themselves as white Americans. 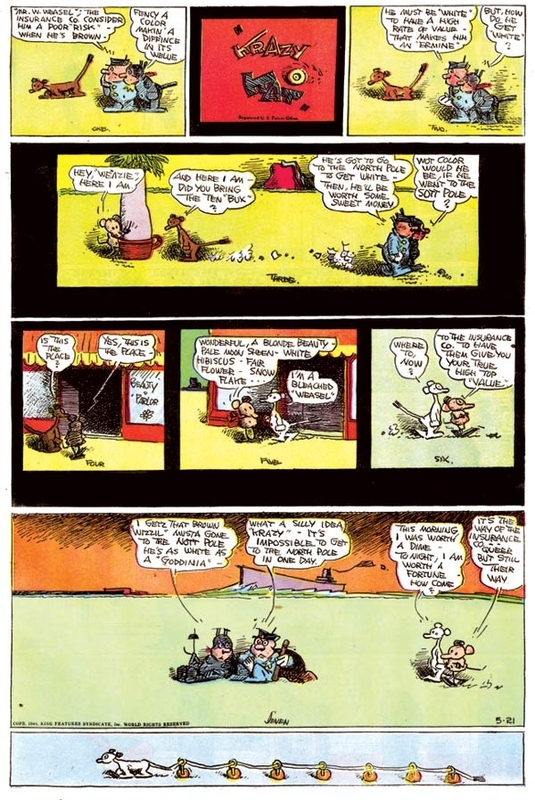 Herriman would grow up and become a cartoonist, creating the greatest of all comic strips, Krazy Kat (1910-1944). When he died he was listed in the death certificate as Caucasian. The facts are clear but what are we to make of this story? Did Herriman realize that he had black ancestor and that his family was passing? Did he knowingly go along with the passing or did he simply grow up thinking he was white? If he knew about the passing (and himself consciously passed) how did he feel about it? This Gallup poll on the identity of America’s “greatest enemy” got fairly good press coverage when it was released in late March, but there’s a lot of food for thought in it that is worth addressing even if we’re a couple of weeks on from the headlines themselves. First, it’s not shocking to see Iran, America’s multi-decade bête noire, at the head of the list. The U.S. government has done a serviceable job of heightening the perceived threat from that country over the past few years, and the dark hand of Iran is increasingly being pointed to as an explanation for continuing stagnation and violence in Iraq (see Gen. David Petraeus’s testimony to Congress on April 8 and 9). Iran was the first choice of 25% of respondents, a proportion which is certainly high, but nowhere near as high as Iraq’s 2001 market share of 38%. If you talk to Russians and East Europeans of a certain generation, their faces will light up if you mention Cheburashka. The star of a children’s book and series of short films, Cheburashka is as beloved in the east as Winnie the Pooh and the Muppets are in the west. He looks a bit like Walt Kelley’s Pogo, especially when juxtaposed against his friend the crocodile Gena. In an article for Slate, I took a deeper look at the controversy surrounding Fredric Wertham and the postwar anti-comics crackdown. During the course of my article I made reference to Michael Chabon’s much-loved novel The Amazing Adventures of Kavalier & Clay (where Wertham figures as a very minor character). Somewhat to my surprise, Chabon took umbrage at my reference to his novel. His response to my article (and my reply to him) can be found here. The New York Observer, a gossipy Manhattan weekly, even did a write-up of the whole controversy (proof that this is a very slow, verging on comatose, news day). Rather unintentionally, I seem to have created a literary donnybrook. I should say, not just in the interest of peace and goodwill but in all honesty, that I have nothing but the highest regard for Chabon as a writer. Charles Burns’ cover for Raw #4. Is there anyone in the cartooning world who is more underrated than Francoise Mouly? She has strong claims to be the most important comics editor of the last 30 years, but I suspect that if you asked your average comics fan or even cartoonists to name influential editors, Mouly wouldn’t come trippingly off their tongues. Part of the problem is that she’s done some of her most important work alongside her husband Art Spiegelman. Mouly is very much her own woman and not one to hide in the shadow of her famous mate; nor is her husband the type to keep his wife away from the limelight; still, it is all too easy for journalists, a habitually lazy lot, to do quick profiles of Spiegelman’s life, touch on his editorship of Raw, and ignore Mouly’s contribution. (God knows, I myself have been guilty of doing that).